Published by Faber & Faber in May 2015. Timothy Hart is getting used to the good life with his imagination box. Anything he can imagine, he can create, which is great, yeah? However, there is one rule - the box mustn't leave Tim's room. Until he notices the strange people following him, and then chasing him, and his beloved imagination box being ripped from his hands. 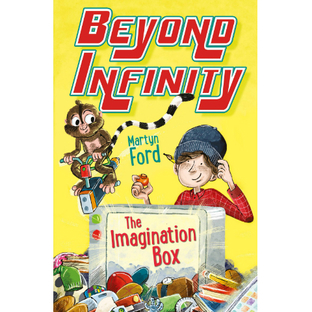 Sequel to the critically acclaimed debut, The Imagination Box. Nearly a year has passed since Tim, Dee and Phil the finger monkey (with the help of some fire-breathing bear-sharks) defeated Wilde Tech Inc and destroyed the imagination space. ​But since then, it's become increasingly clear that there's something wrong with Tim. His imagination seems limitless - anything he imagines immediately appears in front of him, with no need for the imagination box. Which has both good and bad consequences. Then, in the blink of an eye, everything changes. Tim wakes up and discovers he's in his old orphanage. No one, not even Dee, knows who he is. He's completely alone - his worst nightmare. ​But soon he realises who is to blame. His old enemy, Clarice Crowfield, has hijacked a new, all-powerful machine and created a reality where she is in charge. Tim must find Professor Eisenstone, convince Dee that they really are best friends (and, of course, recreate Phil) - then literally put their world to rights.